This app displays the internal names of contact account names and types, and their linked contacts groups, which are located on your Android device. If these informations can be used with our contacts apps, XlContactExport and XlContactImport, the approach of the app can also be useful as a way to understand "what’s going on" on your device. Indeed, contact account names and types, as well as the group names, are most of the time translated on the Android interface (and maybe sometimes hidden), and the internal names sometimes appears at the surface after failed operations, like failed sync operations (as seen on the Android forums). 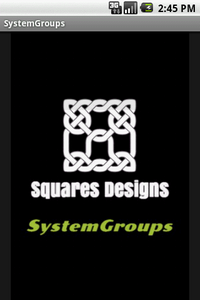 From 1.1.10 version to above, SystemGroups works from Android 2.3 to 8.x devices. 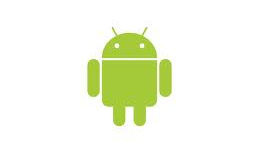 Version 1.0.6 is still available on Google Play if your Smartphone is equiped with Android 1.6, 2.0.x, 2.1.x or 2.2.x. 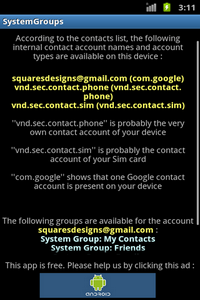 SystemGroups has been tested on Android 1.6, 2.x, 3.x, 4.x, 5.x, 6.x, 7.x devices. Tests on Android 8.x are currently in progress, but as the early results show, the app should work fine too. Note : android.permission.GET_ACCOUNTS and android.permission.READ_CONTACTS are complementary, as all accounts are not necessarily carriers of contacts. Download the latest version of this app on Google Play, the new incarnation of the Android Market, or (in a few months to come) on the Opera Mobile Store. See here.